Today’s deal is the ultimate time-saver for any designer, bringing you literally thousands of ready-to-use items, right out of the box. Textures, patterns and backgrounds are some of the most useful elements designers can work with. From brand work, to print design, to simply giving your creations an authentic edge, they’re invaluable. 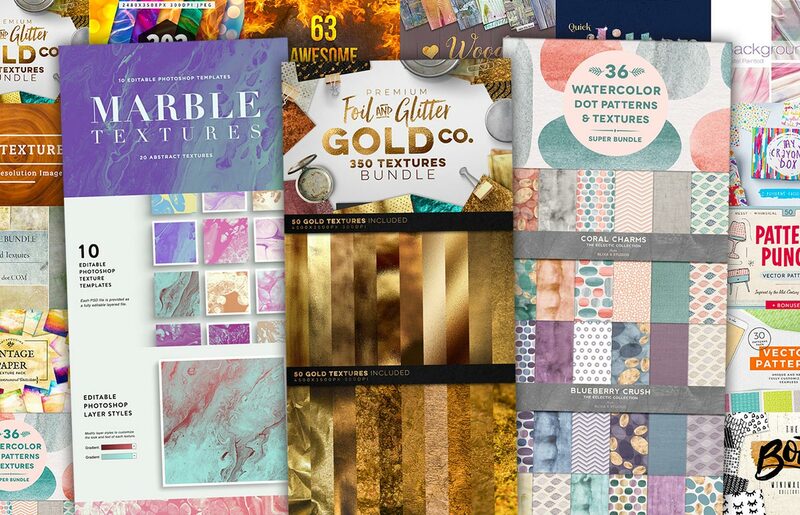 Inside this new bundle you’ll discover a vast collection of gorgeous surfaces and patterns, there’s so much diversity you’ll be covered for any project that comes your way! With 99% cut off the total value, this is the perfect time to obtain a range of professional quality design assets from the industry’s greatest and elevate your work to a whole new level. Scroll through the range of products featured in this collection and you’ll be amazed at the variety. There’s loads of materials that are in trend at the moment, such as foil, marble and watercolour textures; Stacks of timeless assets that will serve you for years to come, like vintage papers, seamless patterns and floral backgrounds; As well as a mix of really cool and creative products like fire images, digital effects and abstract graphics. This is a truly comprehensive collection that you can delve into whenever you need an interesting or useful image to complete a piece. At their regular prices, this collection of products totals to over $2000, but thanks to the 99% discount you can download them all for just $29. This fantastic price also includes the best licensing terms you can get, which covers you for usage in your commercial work, along with any saleable artwork you create. Textures, patterns and backgrounds often form such as integral part of a design, so nonrestrictive terms like this gives you real creative freedom. This deal won’t be around for long, and once it expires, these products aren’t likely to be discounted like this again, so be sure to grab yourself a copy while you can!